B.A. Campbell has written a very detailed look at some of my games over at Innsmouth Free Press, a micro-publisher that deals in horror and dark fiction. The piece is critical and flattering. If Babies Dream was, alchemically-speaking, a chunk of carbon, Looming is Weir’s lapis noster. Visually, it is perhaps the simplest of his achievements… Oddly enough, the monotony of the presentation, alongside the soundtrack of howling winds and weird, croaking wildlife, helps to evoke exactly the sense of loneliness and isolation that the name of this realm, “Looming,” suggests. And with no fancy textures to distract the eye, Looming’s colossal broken gears and Apatosaurus-sized rib bones can’t help but arouse a fundamental awe… and fear. Thanks in part to a rush from Armor Games, “(I Fell in Love With) The Majesty of Colors” has been played over 1,000,000 times. I can’t resist big, round milestones, and I remain overjoyed that so many people liked my little tentacle game. Casual Gameplay/Jay Is Games has released their Best of Casual Gameplay 2008 awards, and my game “(I Fell In Love With) The Majesty of Colors” won the Audience Award for the Best Interactive Art or Webtoy (Browser) category! I got 15.9% of the popular vote, beating out such awesome games as “I Wish I Were the Moon” and Coil. Those two games shared the editors’ award for the same category, which was entirely deserved. 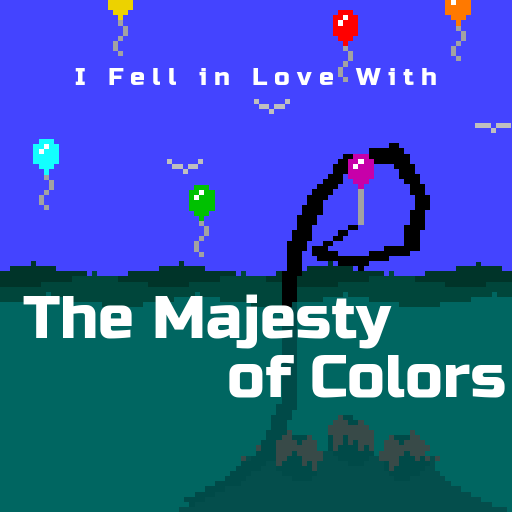 In place of my usual column at GameSetWatch, I was requested to do a general postmortem of “The Majesty of Colors” this time. I’ll point you that way if only for the inclusion of my initial design sketch for the game. It was an interesting experience writing the piece; usually, this sort of evaluation involves more than one person, so it’s easier to pick out successes and failures. When everything is your fault, it’s tricky to pick out specifics. Because of the forum of GSW, I left out a few points that I was tempted to include. Here are a few of them.